For Jason, entering the seventh grade is like walking into a dangerous new world. Now that he's in junior high school, he's a small fish in a big pond stocked full of ninth-graders. It's so scary that he won't even go to the bathroom if there's a ninth-grader in there-no matter how badly he has to go! But it isn't all bad. He's working on a model space station in shop class, and he's beginning to notice things he never paid attention to before, like body hair-and girls. Especially one girl: the beautiful, hair-flicking cheerleader Debbie Breen. 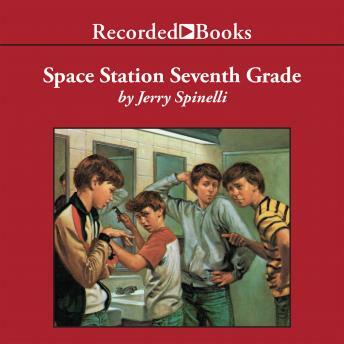 This wonderfully realistic audiobook, written by Newbery Award-winning author Jerry Spinelli, attracts teen-aged readers with its combination of honesty and embarrassingly funny situations familiar to every teenager. Johnny Heller captures Jason's emotional roller coaster ride as his boggled mind tries to keep pace with his friends, family, school, and his changing body.